Back office system for onboard retail. Solution includes tools for meal planning, loading content, flights scheduling, dispatching material, printing relevant invoicing and inventory documents. Inflight+ supports also mobile sale terminals for onboard sales. System works on the Windows Azure platform and is available as a web application. Manage trolley assemblies, their content, loading for individual flights. Assemblies and trolleys are created separately for each carrier. Define products and their positions in drawers. Amount of products may be depending on some conditions, like PAX amount. Group of standard or individual trolleys, which defines flight content. User can choose default configuration, edit it or add individual content. Flights are loaded from flight schedule. You can add non-scheduled flight. Amount of PAX, types of aircrafts and configurations are refreshed according to actuality. When user will choose standard configuration, he can checked in the flight in one step. If user wants to make some changes in trolleys, he must create, change and check-in the flight. Material plan for a day is also available. But all flights for current day must be created. Inflight+ offers also a solution for onboard sales. Board crew can sale products by POS or mPOS terminals. 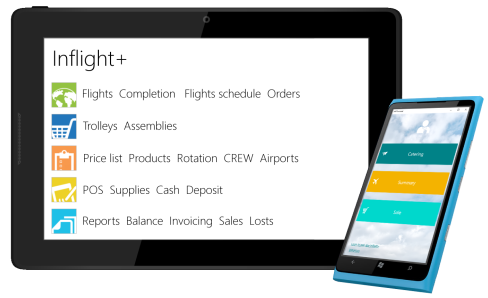 Sale terminals record all sales, prices and cash balance and sends required data to Inflight+, where you can analyse them. Our mobile application "Inflight mPOS terminal" is now available on Google Play. Direct connection with Inflight+ to load flight content and save sales data. No need to work with additional ZIP files or FTP storage. Predefined user roles for loading content / onboard sale / saving sales data. Mobile app enables operation on a wide range of devices. Easy installation from Windows Store or Google Play. Interface provides real-time data about warehouse, outgoing materials and onboard operation using ODATA protocol. Integration with Reporting tools or ERP systems. Our solution helps catering or travel providers to increase revenues and improve business process. These companies are already on board with us. Workflow for this kind of retail needs the records about revenues in multiple currencies on one side, and cash return from crew staff on the other side. And the task is to pair it all together! Cash balance in basic currency for selected time period. Possible drilldown for revenue/flight, crew members and other currency details. Balance for crew member – filter by crew member and date – a basis for bonus payment, or checking whether all revenues are collected from crew. This app gives balance information to crew members. Users can login via Facebook, and display only their own data – cash balance for serviced flights, month summary with drilldown details. Optimized for mobile devices.